This yellow E-Type Jaguar looks the part – on show in front of the muted tones of an Italian village perhaps? However, I saw the E-Type in 3 WISE MEN in a softer yellow. If there is one part of 3 WISE MEN that seems to leave a lasting impression on my readers, it is the section that includes the classic yellow E-Type Jaguar car. I won’t give too much away, but this car becomes a symbol of freedom for Jak and yet also a crisis in his life. Here’s a small extract from 3 WISE MEN. 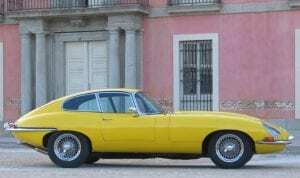 [A yellow E-Type Jaguar pulled up with its wire-wheels flashing brightly. He stepped off the footpath and into the passenger seat. Jak paused to take in what Nina said and closed his eyes. He sank into the comfort of the car and its quiet ride. In a short time, he was snoring. Nina rubbed her hand through his curly hair and smiled. She eased off the accelerator, and they motored leisurely into the late afternoon sun, its orange glow radiating like a raging fire across the distant sky. She felt relaxed and pleased with herself. Nina nudged the E-Type along the coastal route, skirting the industrial hub of Genoa. The exhaust growled when she put her foot to the accelerator to ascend up the Alpes-Maritimes freeway. 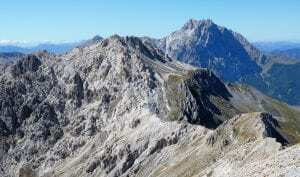 They climbed past small villages and deeper into the rugged terrain and finally pulled over near the summit. Nina’s sunglasses reflected her view across an expansive massif of rolling peaks—their aged and bare ridgelines bent like knuckles, rolling steeply to the sea. She imagined a photographer posing her in the perfect position—dark glasses, yellow E-Type against a warm orange sunset. “Elizabeth Taylor would have been jealous,” she whispered. Jak found it awkward to climb out of the low seat, relieved to stretch his legs and inhale the cool coastal breeze. “Thanks! You think of everything,” Jak replied. By this time, a small group had gathered to admire the classic car. Yes indeed – a car that turns heads. I have sat in an E-Type and it enfolds you in a position just above the road – very confined when compared with modern SUVs! This particular E-Type occupies a pivotal space in 3 WISE MEN – one that ratchets up the tension even more for Jak. 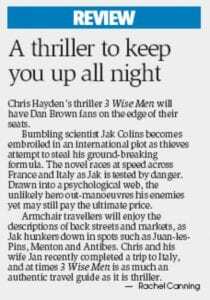 3 WISE MEN is available in Kindle or paperback format from Amazon. 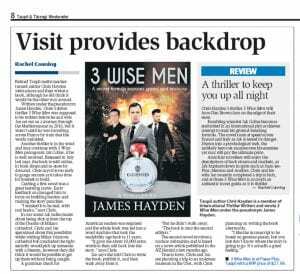 Another great review of 3 WISE MEN – this time in the Weekender by Rachel Canning. Readers of 3 WISE MEN will find themselves immersed in exotic locations. Most are centered on the Mediterranean. The French Riviera follows a beautiful section of the northern Mediterranean coastline. 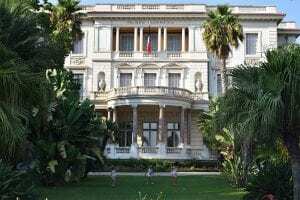 Côte d’Azur was the name given to this exotic coast by the writer Stéphen Liégeard in his book, La Côte d’azur, published in December 1887, and the name has stuck-and even become synonymous with ritzy vacation hotels for the rich and famous. What a perfect location to contrast the tension building in our protagonist’s life when he is captured-literally- by the Riviera’s charms. Jak responded, impressed by the softness of her red lambskin gloves and engaging smile. “Pleased to meet you. Were you staying in Antibes?” she enquired. “Oh, it’s charming I guess.” But his thoughts fled elsewhere, searching for answers. His head slumped to read the unfolded note in his hand. Jak nodded and raised his eyes to view the lights now sparkling along the coast. The horizon had vanished into a cobalt-gray shroud. Night was closing in and he sought solitude. 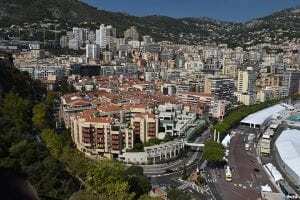 “He accelerated around the waterfront, passing between the rows of opulent apartments on his left and super yachts in the marina to his right. People on the sidewalk turned their heads in reaction to the loud disruption. Léo ignored them. He threw the bike from side to side up the Boulevard Albert, frantically searching for an escape route. To regain his equilibrium, he focused on the distant hills and glimpses of the Mediterranean—wondering if this nightmare would finish without them both being killed. “Where can I escape?” Léo asked himself. He lowered his speed and turned tightly into Rue Grimaldi. 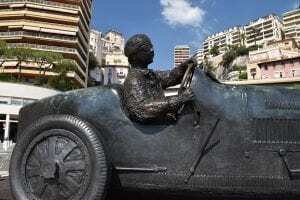 Near the top of the rise, he paused alongside a bronze statue of the winning entry into Monaco’s first Grand Prix. The life-size driver—Grover Williams—was in racing mode and leaning over, as if looking at something. Léo looked too. James Hayden has just been accepted as a new member of the International Thriller Writers (ITW), Inc. ITW was launched in 2004 by a group of writers who saw the need for a different kind of authors’ group – one dedicated to the celebration of the thriller genre. What emerged was a service organization founded by authors, for the benefit of authors, and run by authors. ITW is truly “international” with more than four thousand members from around the world whose cumulative book sales total almost three billion copies. There will be more news soon about this great opportunity for James Hayden. You would too, after going through what Jak did! No wonder his decision-making soon get blurred after his flight leaves Rome, heading for his meeting in Milan. Italy is a rugged country, with a spine of mountains reaching out of The Alps like the arm of an octopus. These peaks – known as The Apennines – can play havoc with weather patterns over Italy – as Jak soon finds out. Read more in 3 WISE MEN. Choices – The Road or the Gardens? … “Shall we get going then?” David asked impatiently. Pierre did not respond. He took his time to scrutinize the faces now mingling beneath the canopies nearby. Nothing was unusual, except for a mixed-aged couple at the café opposite—a gray-haired man romantically entwined with a younger lady wearing a dark beret. “Dirty old man,” Pierre thought, before turning back to David. Life is about choices and David has the choice between taking the road or going through the leafy gardens of Le Musée Masséna (pictured here). I wonder which he will choose and will it matter? The two main ideas for the plot in 3 WISE MEN were swirling in my imagination for several months before writing began. These ideas were a springboard for a novel but, alone, were not enough – I needed substance for the scaffolding; substance that built characters, locations that fitted the themes, and carefully timed dramatic events. Without its plot, 3 WISE MEN would not have begun; with it, the subsequent twists and turns fell into place! A plot is like an hypothesis in a scientific experiment – it only gets you started. Who wrote this fake news? “… His head slumped to read the unfolded note in his hand. He crushed the paper as the truth exploded on him. In the opening paragraphs of 3 WISE MEN, Jak is confounded and can’t figure out whether he was being set up. 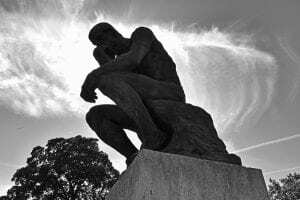 This dilemma – in a foreign country and on the run – reminded me a little of Rodin’s statue – ‘The Thinker’. Jak – like The Thinker – is deep in thought as he tries desperately to solve the puzzle and resolve his predicament. Everything around him is a swirling mess and he has to get to his meeting as quickly as possible. What a great way to start a thriller? 3 WISE MEN Tops 1000! “It’s one small step for a writer …” Thanks for supporting 3 WISE MEN – the blog has now topped 1000 views, although I must confess that many are mine! The most frequent visits were from (in order): NZ, USA, Canada, Australia, South Africa, and Romania. Again, thanks for visiting this discussion area for 3 WISE MEN. Your feedback is highly valued too!